Saab may be gone but Scandinavian cool in motoring is not. 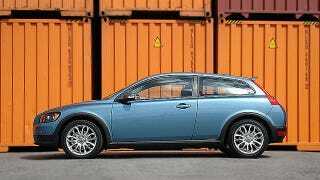 Without much fanfare, boxy, old Volvo has become curvaceous, airy and rather desirable. It may have something to do with coffee. The weird thing with Saabs was that they were essentially sensible family cars. Boring, practical family cars with small engines. How could they ever be cool? There was the occasional fabulous concept, the limited edition Darth Vader car with an X in its name, but the average Saab was far from spectacular. Still, there was something nonchalant and cool about their toned-down efficiency. And whatever made Saab cool, it’s increasingly present in Volvo. That elusive something is not easy to pin down. Some of it has to do with Volvo’s displays at motor shows. It’s terribly hard to do a pleasant display at a motor show, because motor shows are held in vast industrial boxes decked out in industrial carpeting, lit with a sea of spot lights and populated by German flacks and hacks trying desperately to look Italian. Yet Volvo’s booths always feel like a bit of chill Scandinavia, wooden flooring, nice, white, minimal lights, good coffee. The coffee is not trade show coffee. What Volvo does at motor shows is team up with Da Matteo, a coffee roaster and bar based in Gothenburg, like Volvo, and fly them to the shows. Da Matteo are a fine example of Nordic coffee culture, which has something to do with using high-end Italian equipment to create something very non-Italian. In Geneva, I had several great flat whites prepared by Da Matteo’s Jesper Bood, who tweeted after the show that they’d gone through 120 pounds of coffee over two days. That’s a lot of coffee. This may all be beside the point. But they could get away with serving generic crap trade show coffee, using the same industrial carpeting and lighting as everyone else—but they don’t. What they do is present a holistic image of clean Scandinavian design. Over the past 15 or so years, mostly due to the efforts of their British designer Peter Horbury, the modern Volvo has become a visually interesting car. Gone are the fusty old diesel bricks. Instead, you have genuinely cool small cars like the C30 (photographed on top, in Gothenburg, naturally). The soothing interior of the S80 sedan. The flowing, all-glass exterior of the new V40, a small family car introduced in Geneva. They even used to have a V8. This post is nothing but a gut feeling. And you could well be totally cynical and say how easy it is to manipulate internet monkeys with good coffee. But, cynicism aside, consider a C30 with its funky glass back and with its 227-hp inline-5 turbo and it will feel like just the sort of Saab which made Saabs so elusively cool. Whenever I see one on the street, I have to remind myself not to want one. It is, after all, a Volvo. A boxy, old Volvo. Except it isn’t. Photos by Danielo Cavalli (C30) and Volvo (S80).